Adjusted earnings per share (EPS) of $2.21 on revenue of $12.97 billion. vs. analysts' estimates of EPS of $1.95 on revenue of $12.55 billion.. 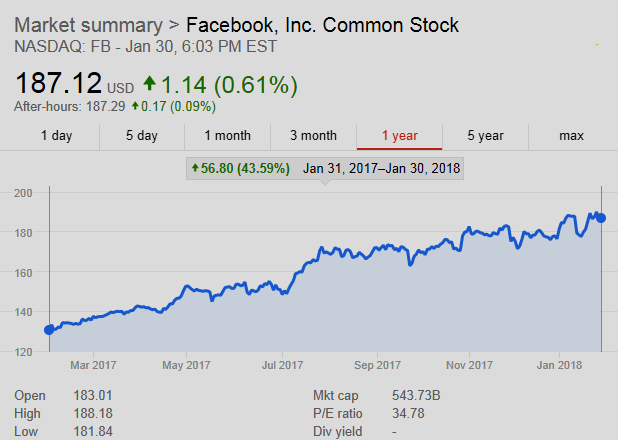 Monthly active users (MAUs) of Facebook rose 14 percent to 2.13 billion, and average revenue per user (ARPU) came in at $6.18, exceeding consensus estimate of $5.90. • Monthly active users (MAUs) – MAUs were 2.13 billion as of December 31, 2017, an increase of 14% year-over-year. • Mobile advertising revenue – Mobile advertising revenue represented approximately 89% of advertising revenue for the fourth quarter of 2017, up from approximately 84% of advertising revenue in the fourth quarter of 2016. Facebook with its Messenger, WhatsApp, and Instagram, owns four of the world’s largest social media / messaging services. Facebook alone is used by more than 2 billion people per month and both WhatsApp and Messenger also passed the billion-user milestone in 2016. Facebook's Aggressive Moves on Startups Threaten Innovation | WIRED.com: Will Facebook Kill All Future Facebooks? Facebook braces for new E.U. privacy law--WashingtonPost.com: General Data Protection Regulation commonly referred to as GDPR. Jennifer Fonstad, managing partner and co-founder at Aspect Ventures, discusses the closing of a $181 million second fund, making the firm the biggest venture outfit created and run by women. She speaks on "Bloomberg Technology." Bloomberg.com video above published Jan 25, 2018. CNBC.com video above published Jan 26, 2018: Kevin Johnson, Starbucks CEO, speaks to "Squawk on the Street" about the coffee giant's quarterly earnings, the state of the business in the U.S. and China and what innovations could come for the brand. 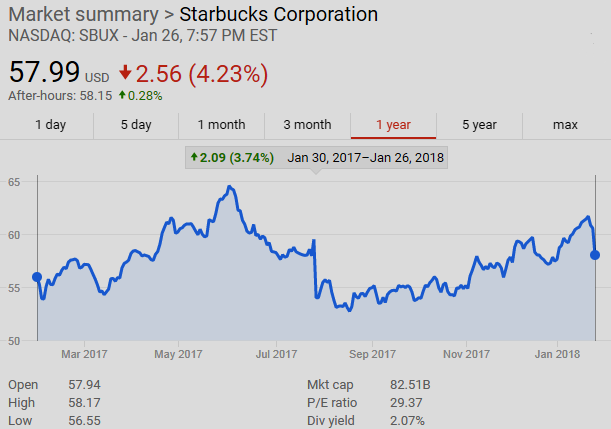 Don't Worry, Starbucks Corporation (SBUX) Stock Will Bounce Back | usnews.com: "A disappointing quarter doesn't change the big picture for one of retail's best operating companies." Starbucks Reports Q1 Fiscal 2018 Results | investor.starbucks.com Jan 25, 2018: "... Net Revenues Up 6% to a Record $6 Billion; Global and U.S. Comp Store Sales Up 2%, China Net Revenues Up 30%; China Comps Up 6% Q1 GAAP EPS of $1.57; Non-GAAP EPS of $0.65 Includes $0.07 Benefit from U.S. Tax Law Change Company Adds 1.4 Million Active Starbucks Rewards™ Members in the U.S. to 14.2 Million, Up 11% Year-Over-Year ..."
Starbucks lower after comparable sales disappoint - Starbucks Corporation (NASDAQ:SBUX) | SeekingAlpha.com: "Global comparable store sales rose 2.0% during the quarter to fall short of the +3.0% consensus estimate." Labels: beverage, brand, China, coffee, earnings, food, innovation, Investing, investors, SBUX, Starbucks, U.S.
News Review | IANA Transition Unwind? ICANN Nightmare or Fantasy? Domain Mondo's weekly internet domain news review (NR 2018-01-28) with analysis and opinion: Features • 1) IANA Transition Unwind? ICANN Nightmare or Fantasy? 2) ICANN news: a. As goes France.com so goes new gTLD .AMAZON? b. GDPR & WHOIS Webinar, c. New gTLD .AFRICA Litigation Update, d. NomCom & ICANN Dysfunction, 3) Names, Domains & Trademarks: Q4 2017 $VRSN, $GDDY, 4) ICYMI: Russiaphobia and more, 5) Most Read. 1) IANA Transition Unwind? ICANN Nightmare OR Ted Cruz Fantasy? Make the internet American again? Trump pick opened the door | Politico.com Jan 23, 2018: "[David] Redl promised the senators [Cruz and Lee] that he would recommend convening a "panel of experts to investigate options for unwinding the [IANA] transition," according to a letter that POLITICO obtained through a Freedom of Information Act request ... Sen. Brian Schatz (D-Hawaii) briefly blocked Redl himself over concerns that he'd cut some deal with Cruz ... Schatz said the idea of undoing the internet transition "may be an interesting political topic" but is ultimately a "fantasy." Remarks of Assistant Secretary David Redl at CES 2018 | NTIA.doc.gov Jan 9, 2018: "I'll also focus on being a strong advocate for U.S. interests within ICANN. We need to ensure transparency and accountability in ICANN's work. And in light of the implementation of the European General Data Privacy Regulation, or GDPR, we need to preserve lawful access to WHOIS data, which is a vital tool for the public." After which they would understand how we got to this point, and what the U.S. government needs to focus on going forward. ICANN may have already sown the seeds of its own destruction with its hundreds of gTLD contracts in perpetuity, against the advice and counsel of the U.S. Department of Justice Antitrust Division (pdf) delivered to ICANN by NTIA in 2008 (pdf). If so, the good news is that what comes after ICANN could be a lot better for the global internet community and restore the principles of Jon Postel's RFC 1591 to the governance of the global DNS and root. The bad news is that what comes after ICANN could be as bad, or even worse. French government claims back "France.com" (as trade mark and domain name) [from France.com, Inc.] | ipkitten.blogspot.ca comment "the French government interestingly argued that under Art L.3111-1 of the Public Property Code, "the property within the public domain are inalienable and imprescriptible" and that the TM and domain name "France.com" fall within this category." "this term ["France"] refers to the national territory in [terms of] its economic, geographic, historic, political and cultural identity"--French Court of Appeal ruling in favor of the French government against trademark holder and domain registrant France.com, Inc.
"The community is encouraged to provide input on the proposed models [PDF, 623 KB] by 29 January 2018. Please send your feedback to gdpr @ icann.org. More information on ICANN's data protection/privacy activities is available here." Webinar 2 February 2018 15:30 UTC / 10:30am ET (U.S.) via Adobe Connect Send dial-in requests to gdpr-questions @ icann.org. Dial-in Information. Participant Codes: English – Participant Code: 9001; Français – Participant Code: 9002; Español – Participant Code: 9003; 中文 – Participant Code: 9004; Pусский – Participant Code: 9005; العربية – Participant Code: 9006; Português – Participant Code: 9007. ARTICLE 29 Data Protection Working Party Letter to ICANN 6 Dec 2017 (pdf): "At first glance it would seem that since ICANN and the registries jointly determine the purposes and means of the processing of personal data for the WHOIS directories, ICANN and the registries are joint controllers. This would mean that both ICANN and the registries must ensure that personal data are processed in accordance with the obligations of the European data protection laws." Europe's GDPR Meets WHOIS Privacy: Which Way Forward? | Electronic Frontier Foundation | EFF.org: ".... There are other cases in which it makes sense to allow members of the public to contact the owner of a domain, without having to obtain a court order. But this could be achieved very simply if ICANN were simply to provide something like a CAPTCHA-protected contact form, which would deliver email to the appropriate contact point with no need to reveal the registrant’s actual email address [or even name]. There's no reason why this couldn't be required in conjunction with ICANN's Model 3, to address the legitimate concerns of those who need to contact domain owners for operational or business reasons, and who for whatever reason can't obtain contact details in any other way." Editor's Note: Read EFF's submitted comment here (pdf), with which I concur. 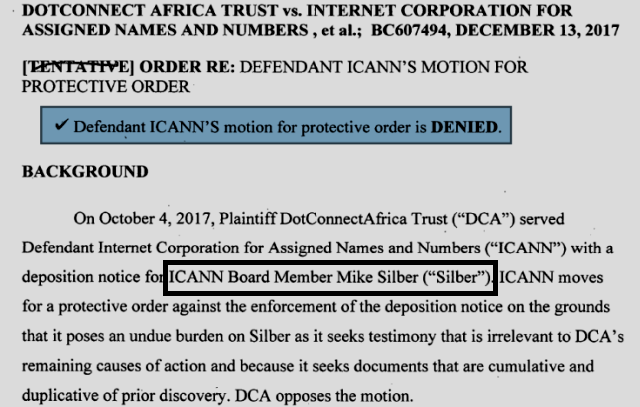 Editor's note: Mike Silber was selected for the ICANN Board by the Country Code Names Supporting Organisation in 2009 and elected to a second term in 2012 and a third and final term in 2015, which will expire at the Annual General Meeting in 2018. According to his ICANN bio, he was responsible for the redelegation of the .ZA ccTLD and served a Director and Treasurer of the Authority from its formation in 2004 to 2015. ZA Central Registry is also the registry operator for new gTLD .AFRICA. c. Trump Antitrust Policy after One Year (video) | The Heritage Foundation | heritage.org: "The Trump Administration has brought leadership changes at the two federal antitrust agencies, the Department of Justice Antitrust Division and the Federal Trade Commission." See also: Trump nominates 4 to FTC: Joseph Simons, antitrust attorney from the Paul Weiss law firm, as new FTC chairman; as well as Noah Phillips, chief counsel for Senate Majority Whip John Cornyn (R-Texas), and Delta Air Lines executive Christine Wilson for a third GOP slot. Trump also nominated consumer advocate Rohit Chopra for a Democrat slot, which will leave one (Democrat) vacancy on the completely revamped Commission. Top Dems call on Twitter, Facebook to investigate Russian bot campaign | TheHill.com: "A source familiar with Twitter's analytics, though, said "the hashtags appear to be organically trending," and not the result of a Russian-led influence campaign." Your Phone Is a Prison | VICE.com: "Han conceives of the digital world as a prison (a “digital panopticon”) in which you are an isolated inmate, sitting there staring at your phone, but can be monitored by a whole host of prison guards, such as Google, Facebook, and Acxiom.com." How Will Macau’s New Cybersecurity Legislation Impact Freedom of Speech? | GlobalVoices.org: "It also mandates that ISPs retain their users’ online activity logs for at least one year." EFF Asks Ninth Circuit Appeals Court To Strengthen Privacy Protections Of Smart Phones At The Border | Electronic Frontier Foundation | eff.org: "Warrantless Border Searches of Phones, Laptops, Are Unconstitutional"
Canadian app in the fight for internet freedom in Iran | CBC.ca: "approximately 15 million Iranians were using the Canadian app Psiphon." U.S. Sanctions Abet Iranian Internet Censorship | ForeignPolicy.com: U.S."should liberalize rules that impede access to cutting-edge tools against repression." The Rapid Rise of Censorship in Southeast Asia | TheDiplomat.com: "From Myanmar to Indonesia, governments are clamping down on the internet and social media." Tech Review (TR 2018-01-27)--Domain Mondo's weekly review of tech news with commentary, analysis and opinion: Features • 1) Is Google Done? 'Can No Longer Innovate' Says Ex-Googler, 2) Big Tech vs. Antitrust & Unfair Competition Laws, 3) Investing: The Week, Investing Notes, 4) ICYMI Tech News. Alphabet Inc. (Google) $GOOG $GOOGL. Q4 2017 results will be released Feb 1, 2018, after market close. EU Fines Qualcomm, Are Facebook and Amazon Next? EU fines Qualcomm €997M for abusing market dominance, says $QCOM paid Apple to buy LTE baseband chipsets from Qualcomm exclusively; Qualcomm appeals. See also HQ2 Much - Amazon.com, Inc. (NASDAQ:AMZN) | SeekingAlpha.com by Scott Galloway: "I'm announcing a contest to decide which big tech firm should be broken up first. The finalists are Facebook (NASDAQ: FB) and Amazon [NASDAQ: AMZN], who both prioritize shareholders over the condition of our souls, or the country's prosperity." Editor's note: The U.S. economy, stimulated by Trump's tax reforms, deregulation, and emphasis on U.S. domestic investment, could, in sum, easily handle an increase in Fed rates of 200 basis points or more. Ray Dalio says this "short-term stimulus" is producing a “12-to-18-month spurt, ... [during which] people feel stupid about holding cash," but instead, could we be looking at a 18-36 month "sprint"? Remember, Draghi and the ECB are dragging their heels, so that puts a brake on how fast the Fed will tighten, and at the same time, Draghi is scared of Mnuchin's cheap dollar. Read Steven Mnuchin vs. Mario Draghi: The ECB Loses | WSJ.com. Why Didn't The Market React To The Government Shutdown Threat? | SeekingAlpha.com: "going to take more than yet another example of legislative ineptitude to do any lasting damage to this rally." U.S. government forecasts U.S. oil production will climb to 11 million barrels a day by late 2019, rivaling Russia, the world’s top producer. Senate Confirms Jerome Powell as Federal Reserve Chairman | WSJ.com: confirmed by a 84-13 vote, new Chairman's term effective when Janet Yellen's 4-year term expires Feb 3, 2018. Immigration in the Trump Era: Senator Hatch's bill would dramatically increase H-1B visas | TheHill.com: "the bill would make sure that holders of U.S. master’s degrees or higher, foreign Ph.D.’s and U.S. STEM bachelor degrees are prioritized ..."
“Blockchain” Stocks Collapse by 40% to 90% | WolfStreet.com. What If Children Should Be Spending More Time With Screens? | WSJ.com: "New guidance on children and technology makes the distinction between passive exposure and active play and learning with screens"
Coming soon: 3 Mega Video Platforms: Disney vs Netflix vs Amazon? But what about Google Play/YouTube and Apple? Leaving Windows: How the Pixelbook replaced my Surface Pro 4, no regrets | ZDNet.com: "I went all in with a Chromebook." China’s JD.com Prepares to Take on Amazon on Its Home Turf | Bloomberg.com: JD.com is in talks to sell 15% of its logistics unit to Tencent, others, as it prepares to launch in Los Angeles in 2018. China: Ken Rogoff Warns "China Will Be At The Center Of The Next Global Financial Crisis" | ZeroHedge.com: "China is probably the place most at risk of having a significant downturn in the near term. It’s certainly the leading candidate for being at the center of the next big financial crisis." Stripe ends support for bitcoin payments April 23, citing volatility and long transaction times. Bitcoin had been supported since 2014--TechCrunch.com. FTC makes second request on Broadcom's bid for Qualcomm: anti-competitive merger? No cash? No problem. A trip to Shenzhen, China highlights how the explosive growth of mobile payments is driving a wallet-free society. WSJ's Jason Bellini reports. Wall Street Journal (wsj.com) video above published Jan 18, 2018. China is living the future of mobile pay right now | CNBC.com 8 Oct 2017: "Mainland Chinese stores and services are increasingly centered around mobile pay apps like WeChat Pay and Alipay. Chinese mobile payment volume more than doubled to $5 trillion in 2016, according to Analysys data cited by Hillhouse Capital. Mobile pay is growing so rapidly in mainland China that as a foreigner, I sometimes found it difficult to complete basic transactions without it. The dominance of mobile transactions lends itself to greater data collection by the Chinese government." Bloomberg Technology video above published Jan 3, 2018: Victor Anthony, internet media managing director at Aegis Capital (domain: aegiscapcorp.com), discusses Waymo (domain: waymo.com) and the future of the internet search business. He speaks on "Bloomberg Markets: The Open." Waymo, Mountain View, CA—formerly the Google self-driving car project—stands for a new way forward in mobility. Waymo is an autonomous car development company and subsidiary of Google's parent company, Alphabet Inc. On November 7, 2017, Waymo announced that it had begun testing driverless cars without a safety driver at the driver position. World Economic Forum video above streamed LIVE January 26, 2018: Donald J. Trump, 45th President of the United States, speaks live at Davos for the World Economic Forum Annual Meeting 2018. World Economic Forum video above: eCommerce could enable small businesses to be global players. What are the next steps? World Economic Forum Annual Meeting 2018 23-26 Jan 2018, Davos-Klosters, Switzerland. Trump will be there--Swiss mountain town Davos relishes its turn in Trump spotlight | reuters.com. See also: Trump to attend World Economic Forum in Switzerland, a gathering synonymous with wealth and power | The Washington Post: "the unorthodox U.S. leader face to face with global elites"
238 applications were received by Amazon.com Inc. (NASDAQ: AMZN) for its second headquarters, HQ2, and now there are only 20 finalists (see map above). Editor's note: the dark horse candidate in the above list is Miami--most of its bid details are being kept secret except it is known that the bid offers five undisclosed sites in Miami-Dade County (including more than one site in downtown Miami--see embedded tweet below), two from Broward County and one from Palm Beach County. The Miami area has long been favored by transplants from the northeast U.S., as well as Europeans and Latin Americans and now, increasingly, Chinese--Why Chinese Investors Love Miami, The 'Hong Kong Of The West' | Forbes.com. And Miami has one advantage the others don't: Amazon founder Jeff Bezos lived in Miami when he was younger, graduating as class valedictorian from Miami Palmetto High School in 1982. See also: Miami mayor says three sites in city in play for Amazon HQ2 | South Florida Business Journal | bizjournals.com Jan 18, 2018. Amazon estimates its investments in Seattle, from 2010 through 2016 resulted in an additional $38 billion to the city’s economy – every dollar invested by Amazon in Seattle generated an additional $1.40 for the city’s economy overall. What is Amazon HQ2? 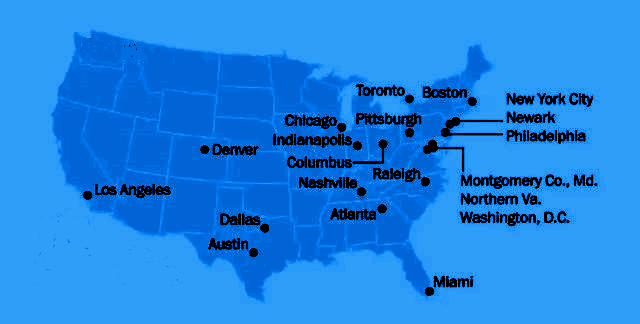 HQ2 will be the second Amazon headquarters in North America. We are looking for a location with strong local and regional talent—particularly in software development and related fields—as well as a stable and business-friendly environment to continue hiring and innovating on behalf of our customers. How have you selected the 20 candidate locations? We evaluated each of the proposals based on the criteria outlined in the RFP to create the list of 20 HQ2 candidates that will continue in the process. What are the next steps of this selection process? In the coming months, Amazon will work with each of the candidate locations to dive deeper into their proposals, request additional information as necessary, and evaluate the feasibility of a future partnership that can accommodate our hiring plans as well as benefit our employees and the local community. We expect to make a decision in 2018. What will be the benefits for the city finally selected to host your second headquarters? We expect to invest over $5 billion and grow our second headquarters location to be a full equal to Amazon’s current campus in Seattle, creating as many as 50,000 high-paying jobs. In addition to Amazon’s direct hiring and investment, construction and operation of HQ2 is expected to create tens of thousands of additional jobs and tens of billions of dollars in additional investment in the surrounding community. Amazon estimates its investments in Seattle from 2010 through 2016 resulted in an additional $38 billion to the city’s economy – every dollar invested by Amazon in Seattle generated an additional $1.40 for the city’s economy overall. Why is Amazon choosing its second headquarters location via a public process? We want to find a city that is excited to work with us and where our customers, employees, and the community can all benefit. Will South Florida lobby for Apple's second campus? | South Florida Business Journal | bizjournals.com Jan 19, 2018. 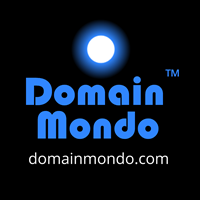 Domain Mondo's weekly internet domain news review (NR 2018-01-21) with analysis and opinion: Features • 1) China Disrupts Global Companies’ Web Access, 2)ICANN news: a. ICANN Jurisdiction & Unintended Consequences, b.GDPR & WHOIS, c. ICANN Draft FY19 Budget & Webinar ... 3) Names, Domains & Trademarks: INTA's Slam Dunk UDRP ... 4) ICYMI: Iran's Internet and more, 5) Most Read Posts. China is plugging the last holes in its 'Great Firewall' internet censorship apparatus, hampering global companies' (and others) ability to operate in the country. Financial Times (ft.com) video above published Jan 17, 2018. UPDATE: In Davos China’s economic-policy mastermind Liu He to speak at 2018 World Economic Forum — Quartz | qz.com: "The 66-year-old is head of the Communist Party’s top economic-affairs steering group, and a vice-chairman of the country’s main economic-planning body. " See also: China Says It Shut Down 128,000 Websites in 2017 | voanews.com: "while the government says its rules are aimed at ensuring national security and stability, human rights organizations have warned that the country’s tough laws governing the internet amount to repressive measures aimed at quashing dissent." 15 Jan 2018 Letter from Göran Marby to Isabelle Falque-Pierrotin (pdf) Chairwoman, Article 29 Data Protection Working Party re: General Data Protection Regulation (GDPR). How Badly Is WHOIS Broken? 15+ New Spam Emails, 9 Robocalls, 6 Spam texts within 24 hours of registering a domain [name] | DomainNameWire.com. If needed, participant passcode 3362488533 (same for both webinars). Go here for more information. See also New gTLD revenue cut by HALF in ICANN budget | DomainIncite.com: "The new gTLD industry is performing terribly when compared to ICANN’s predictions just six months ago." --Kevin Murphy (emphasis added). d. IGO and INGO Identifiers for All gTLDs | ICANN.org: "Contracted parties will have until 1 August 2018 to complete implementation of the new requirements for certain specific names of IGOs, the International Olympic Committee (IOC), and the Red Cross/Red Crescent Movement (RCRC)." See also: IOC, Red Cross, and IGO reserved names. 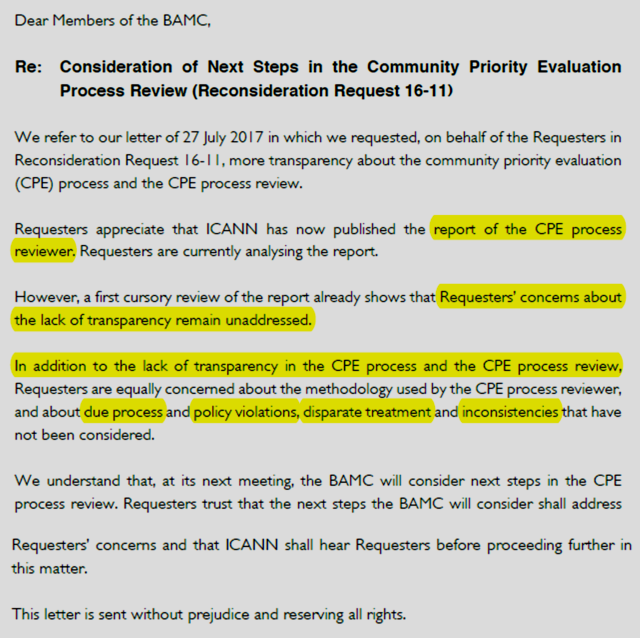 • 16 January 2018 Letter from Arif Ali of Dechert LLP to ICANN Board & Board Accountability Mechanisms Committee (BAMC) re: New gTLD Application for .MUSIC Reconsideration Request and CPE Review. • 15 January 2018 Letter from Arif Ali of Dechert LLP to ICANN Board re: New gTLD Application for .GAY and CPE Review. • ccTLD .au: 'Stakeholder' evaluation called for as auDA moves to implement direct registration | ZDNet.com. • Hackers are flooding the internet with more fake domain names ... | PBS.org: cybercriminals use IDNs to lure consumers to phishing websites that appear exactly like the ones they intended to visit. • Iran: Internet Cut-Off During Recent Unrest in Iran Reveals Tehran’s New Cyber Capabilities | Center for Human Rights in Iran | iranhumanrights.org: a major new report, Guards at the Gate: The Expanding State Control Over the Internet in Iran, the Center for Human Rights in Iran (CHRI) details the advances the Iranian government has made in controlling cyberspace in Iran, and the resulting losses to internet freedom and privacy. Download Guards at the Gate, here (PDF, HTML). • Tech Companies Are Complicit in Censoring Iran Protests | WIRED.com: "But it’s not just the regime that is stripping Iranians of their digital freedom: American technology companies that limit Iranian users’ access to their services—the result, usually, of an overly cautious interpretation of US sanctions—are also, in effect, restricting internet access and hindering free expression." • Russia moves toward creation of an independent internet | DW.com: "The Russian government can't abide the system because it's set up in a way that governments only have an advisory role with ICANN"--former ICANN board member Wolfgang Kleinwächter. • EU: Five EU Commissioners threaten to regulate online platforms if they do not remove more illegal content like hate speech--EURACTIV.com: "heads of more than 20 tech firms, including Google, Facebook, Microsoft, Twitter and Amazon arrived in Brussels for discussions." • The Public Domain Starts Growing Again Next Year, and It’s About Time | Electronic Frontier Foundation | eff.org: "It’s not just small artists that rely on the public domain. Disney’s built an empire on making movies based on public domain fairy tales. Just last year, Disney released a live-action version of its animated take on Beauty and the Beast, a story that has been around since the 1700s ... Creativity is enriched when the public domain is robust and easily accessed, and we look forward to finally seeing it grow once again in 2019." 4. News Review | New gTLD .WEB, ICANN & Verisign, What's Next?